Goodreads Summary: Weather Warden Joanne Baldwin, her husband, the djinn David, and the Earth herself have been poisoned by a substance that destroys the magic that keeps the world alive. The poison is destabilizing the entire balance of power, bestowing magic upon those who have never had it, and removing it form those who need it. It’s just a matter of time before the delicate balance of nature explodes into chaos-and doom. I’m really sad to see this series end, because I really loved it! Total Eclipse is a pretty good end to the series. It was pretty fast-paced, and while it was hard to put down at times, I really wanted to stretch it and enjoy it. The last couple chapters were not what I was expecting, and I was sort of expecting…not what happened. It does make sense, and it’s totally believable, but not what I was expecting. I was expecting more overlap with Outcast Season- which is a spin-off of this series- but we only get a glimmer of connection between the two series. But it’s actually okay that there isn’t, because Outcast Season is a different perspective of the events of this series. 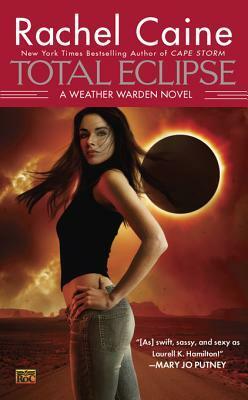 Back to Total Eclipse: there is a point where all things seem lost and hopeless, but as it turns out, things, there was a larger plan that you don’t even think about until the last couple chapters. Speaking of which, I was a little surprised that things were wrapped up nicely. It’s like, you spend 9 books reading about characters who can’t catch a break and have so many horrible things thrown at them, and then the last couple chapters happened. And all of a sudden, things magically work out, and then you get to the epilogue- which happens almost 10 years later- and things are pretty much back to normal. It was nice that things worked out okay in the end, and that things are good for the characters. And it’s nice to know that there really was a larger plan in mind for some of the characters, because things that happened before make so much more sense now than they did throughout the book. It’s not that the last couple chapters are bad, because they’re totally not. They’re just not what I was expecting. Still, Caine did a great job at tying up most of the loose ends, and you really couldn’t ask for a better ending. Seriously. Total Eclipse is such a great ending to this series, and while I’m a little sad to see it come to end, there’s always re-reading and there’s also Outcast Season to read. There’s a lot going on, and Caine did such a great job with wrapping things up and keeping me interested. It was also nice to see that everything worked out relatively well for everyone, even with a few losses along the way. Total Eclipse gets 5 stars.